Is too much technology bad for children? Too much of anything is bad for us. Recent news tells us that an overuse of touchscreen phones and tablets is stopping children’s finger muscles from developing sufficiently to enable them to hold a pencil correctly. Depressing news but inevitable. It simply had to happen and here we are. When ‘tablet time’ isn’t moderated and children are given iPads to “keep them quiet” then all that swiping is going to have an impact. It’s easy to point the finger of blame at technology (supposing you have enough strength in your finger to actually point) but technology isn’t the problem here. Accessibility is the key issue and how much screen time children are allowed to have. iPads are not one stop shops to fix a child. Yes, they have their uses but they also have their abuses. The research literature indicates that the use of educational technologies in the classroom and at home can result in positive learning outcomes for young children. But what about hand function? 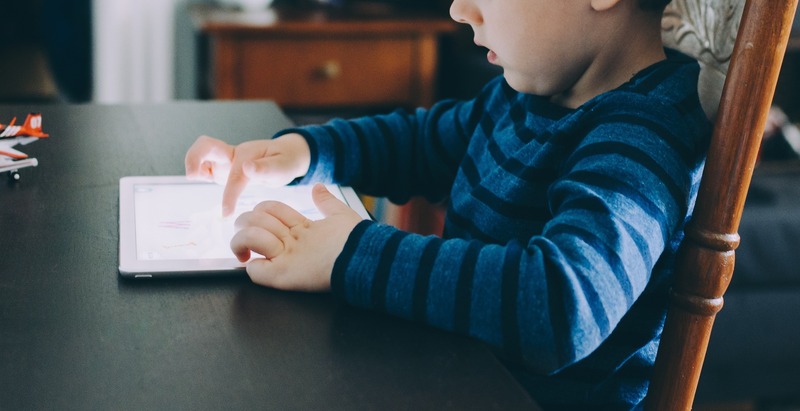 according to Sally Payne, the head paediatric occupational therapist at the Heart of England foundation NHS Trust, children just don’t have the digital strength and dexterity they had a decade ago. Children coming into school are being given a pencil but are increasingly not be able to hold it because they don’t have the fundamental movement skills. Anyone working with Early Years children will have noticed the same thing: fine motor skills have declined to a worrying level. Hardly surprising when we consider that at least 1/3 of children have interacted with a touchscreen by the age of one. Messy play was something all children were actively engaged in but touchscreen devices have taken chunks out of this meaning children are making fewer things with their hands. When children aren’t holding crayons and cutting and sticking then they aren’t building up the strength they need to hold a pencil for learning handwriting. Excessive touchscreen use also means that when children are given a pencil, they aren’t always sure how to receive it or how to hold it. They need more time to build with blocks, pull toys and ropes and use scissors as these lead into the task of writing. Children need strong muscles through the trunk of their body so their arms and hands and fingers are developed well enough to be able to write clearly, legibly and at length. Pinching, swiping, tapping and typing – not exactly physically demanding are they? A lack of physical exercise leaves children with underdeveloped arm and hand muscles and the popularity of touchscreen devices now as ‘soothers’ means children don’t play they way they used to. Are we now going to see a proliferation of fine motor skills support groups spring up to tackle the problem? The problem of course reveals itself further down the line with children in Years 5 and 6 unable to write at length because they lack the stamina. Are we now facing a situation where we have to have special provisions made in the Sats because children just can’t write? It’s wonderful that very young children can paint, listen to music, create their own virtual story puppet show and use simple coding to move a robot using an i-Pad – it really is really wonderful. Let’s not also forget that “Touch screen tablets may offer possibilities to preschool children with disabilities to participate in learning in a digital way” (Chmiliar, 2017). But, it’s frightening to think that children don’t know what to do with a pencil when given one. I think what children really need up to the age of seven is real life in real space and real time, which means three dimensional experiences. You can argue that by not giving children an i-Pad in the first few years of their life won’t do them any harm because technology is moving so rapidly that the apps and games soon become obsolete. Perhaps, but to deny children any digital experience doesn’t prepare them for the future and it can rob them of some genuinely enjoyable educational experiences. Like food, a balanced diet is the way to go. We need both pixels and building blocks. …entirely absent from the literature thus far is a careful consideration of the role of culture. How do families from different cultural communities incorporate mobile devices into the routines of infants and very young children? Pinching, swiping, tapping and typing have robbed children of their physical strength.